Mikaela Shiffrin is adding a new twist to the usual relationship between star athlete and worshipping fans. She's putting the spotlight on the fans. The overall World Cup skiing leader and two-time Olympic champion has quietly started a social media campaign labeled (hashstag)IAmYourBiggestFan to draw attention to some of the supporters who inspire her. "That day, Emma inspired me, and she has inspired me since," Shiffrin wrote recently on Facebook . "I've taken that inspiration with me as I've competed the last seven years. It is a versatile inspiration ... and it transcends sport into whatever you want to do with your life." Shiffrin has become friends with Lundell over the years and gotten to know her family, including Lundell's father, who is still suffering from a brain tumor. 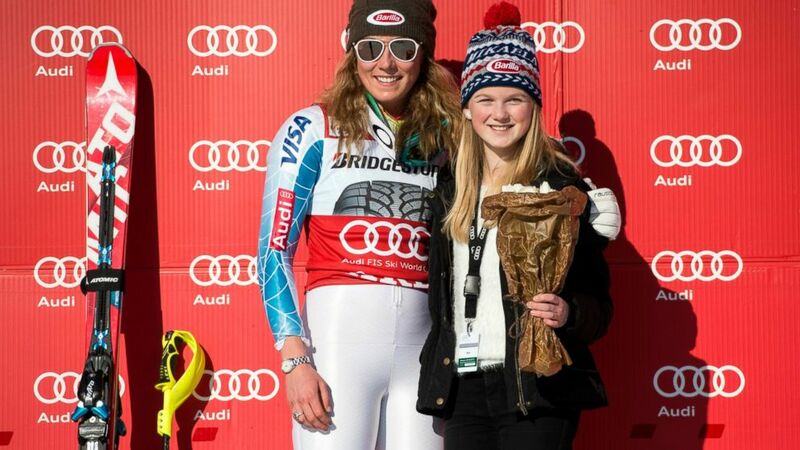 Last season at the World Cup Finals in Are, Lundell hung out with Shiffrin all day when the American won the slalom in Are for the fourth time. She stayed by Shiffrin's side in the finish area, shared the leaderboard spotlight, and even sat with Shiffrin at the news conference for the podium finishers — where Lundell was interviewed, too. "She is kind of this symbol that life isn't fair but you play the cards you are dealt and you play them the best you can," Shiffrin told The Associated Press. "She is always positive. She is always strong — stronger than I think I could ever be. So she is inspiring for me because of that. But also, she is reminding me that I had it really good and I should enjoy being able to do something that I love." "I am not sure if she's able to come, when she's able to come," Shiffrin said. "But for sure, when she comes, if she comes, I am going to see her. That's always the case." For a long time, Shiffrin featured a photo of herself with Lundell on her Facebook profile. And she exchanges messages with Lundell even when she's not in Sweden. "This year she actually had a bit of an issue, an injury, and she was unable to do some skiing for a while," Shiffrin said. "Hopefully now it is starting to heal quite well. ... Her family, her mom, she is always sending congratulations and support. It's amazing to have people like this around you. People like Emma, she is just a good person, she's like an angel. That's always something for me, reminding me to be a good person, to do the best I can, and just to be like Emma, whatever I do." "Days like today when I feel like I'm on top of the world, you're the kind of person who brings me back to earth, and that's a really good quality to have, so thank you," Shiffrin said then. This year and last, Shiffrin surprised Bettoni with birthday wishes in the form of video messages. While last year it was simply a "Happy birthday Angelica: Ski fast and have fun," this year Shiffrin critiqued video of Bettoni's skiing and offered detailed tips on her technique. "I don't do it every time. If I did it every time then the requests would be crazy," Shiffrin said. "But especially with kids back home, if I'm training in Copper (Mountain, Colorado) or something and there are some kids like, 'What do you think?' And I just say, 'Yeah, outside ski or something with your inside hand,' or something like this it's always something I'm thinking about, too." Shiffrin's idols growing up were U.S. great Bode Miller and Austrian slalom standout Marlies Schild , whom she surpassed this season for most World Cup slalom wins. "When I was younger, if Bode said something to me, or my big idols if they said one thing to me, I would remember that forever," Shiffrin added. "So maybe if it helps the next generation that can be something cool and keep ski racing alive and moving forward." Willemsen reported from Maribor, Slovenia.